IsoWhey contains the highest grade whey protein that will keep you fuller for longer and maintain muscle mass whilst you lose fat. Only 8.8g carbohydrates per serve. Gluten-free and only 1.6g of lactose per serve. 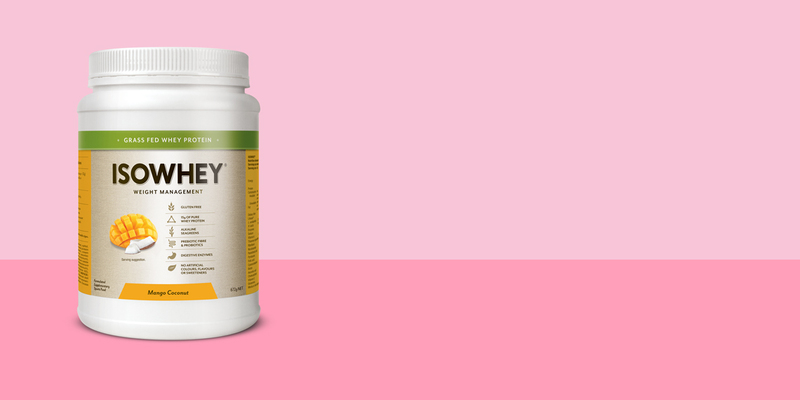 IsoWhey is available in 7 delicious flavours - Ivory Coast Chocolate, Madagascan Vanilla, Salted Caramel, Strawberry Smoothie, Banana Smoothie, Mango Coconut and Classic Coffee. Whey protein concentrate (whey protein, soy lecithin), Litesse® (polydextrose), xylitol, maltodextrin, natural mango, coconut & vanilla flavours, medium chain triglycerides, calcium carbonate (calcium), whey protein isolate, magnesium oxide heavy (magnesium), potassium citrate (potassium), glutamine, xanthan gum, natural colour beta carotene, seagreens (Ascophyllum nodosum seaweed), enzyme mix, ascorbic acid (vitamin C), ferrous fumarate (iron), Lactobacillus acidophilus, chromium picolinate (chromium), zinc oxide (zinc), d-alpha tocopheryl succinate (vitamin E), nicotinamide (vitamin B3), potassium iodide (iodine), manganese sulfate monohydrate (manganese), vitamin A acetate (vitamin A), Bifidobacterium lactis, biotin, cupric sulfate pentahydrate (copper), folic acid (vitamin B9), selenomethionine (selenium), pyridoxine hydrochloride (vitamin B6), calcium d-pantothenate (vitamin B5), riboflavin (vitamin B2), thiamine hydrochloride (vitamin B1), colecalciferol (vitamin D3), cyanocobalamin (vitamin B12). Contains milk and soy. Adults: Mix 1 serve (1 heaped scoop = 32g) into 200mL of full-fat milk or milk substitute. Consume once or twice daily. This product contains 1.6g of lactose per serve; most lactose-intolerant individuals can tolerate 12g of lactose daily.